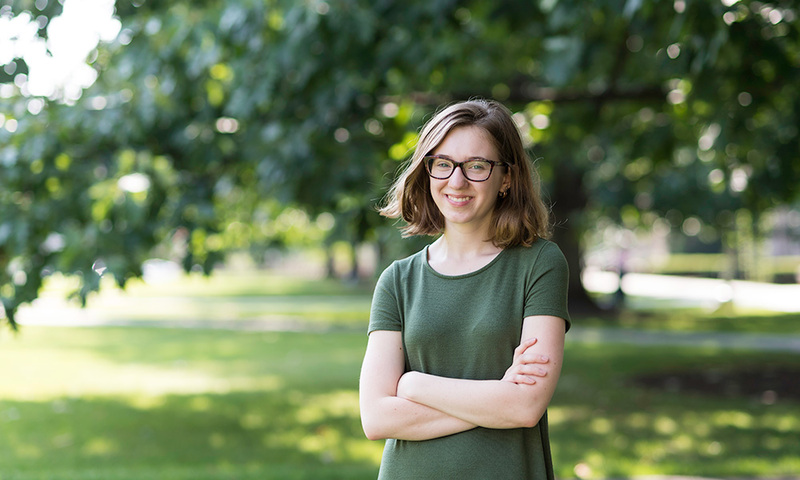 Olivia Alger ’22 spent three years attending the Interlochen Center for the Arts in Michigan, 350 miles from home. When she graduated two years ago, she decided college could wait. “I thought some time off would make for a good adventure,” says Alger, who studied creative writing at the academy. She moved home to Lake Bluff, a Chicago suburb, worked at a hotel for several months, then contacted an organization that sponsors young Americans’ volunteer work abroad during gap years. She spent three months in the south of France teaching elementary school students and refugees. Upon returning home, she worked for an online literary magazine and began applying to colleges. Once Alger applied and visited the River Campus, she knew this was the place for her. “I felt very centered and comfortable, like the twisted detour I took had paid off,” she says. Alger plans to major in English, with a creative writing track. Alger feels her three years at the arts academy helped prepare her for college life. Alger’s hobbies include long walks—“even in the cold,” she says—and making playlists of music ranging from jazz and hip hop to reggae. She hopes to become involved in student government at the College and would love to join writing clubs, and perhaps the Campus Times student newspaper. Let the new chapter begin.